If you read my previous post of my first vegan aioli recipe, Chipotle Aioli, you already know that aioli is one condiment I had a difficult time staying away from after I gave up eggs. So you can imagine my excitement after having come up with a fantastic vegan aioli recipe the first time around! I’ve already used my Chipotle Aioli to create many favorite dishes, such as my Potato Fritter Sliders & Crispy Mushroom Avocado Sandwich. You were also warned that you’ll be seeing a few more vegan aioli flavors coming out of this blog. Well, here is my next creation, a vegan Roasted Garlic Tuffle Aioli! The idea of making a truffle aioli came from a recent visit to what is now one of my favorite vegan eateries, Free Soul Cafe in Tustin, California. Their entire cafe uses only plant-based ingredients, and has plenty of gluten-free options. Although as a side note, if you have Celiac Disease, be sure to ask them about cross-contamination in some of their dishes since they are not completely a gluten-free restaurant. Everything from their sandwiches, burgers, pastas, appetizers, soups, to desserts is delicious! Although I’m far from having tried their entire menu, I have yet to find something I haven’t thoroughly devoured and enjoyed. So, back to my aioli. During my first visit there, I had ordered their Truffle Burger, and it was delicious! So delicious that after finishing my burger, I wanted more. The burger was lathered with a truffle aioli, and I knew I had to recreate a version at home. To deepen the flavor of the aioli, I decided to add one of my favorite ingredients, roasted garlic, to the aioli. Out came another delicious vegan aioli, as promised! 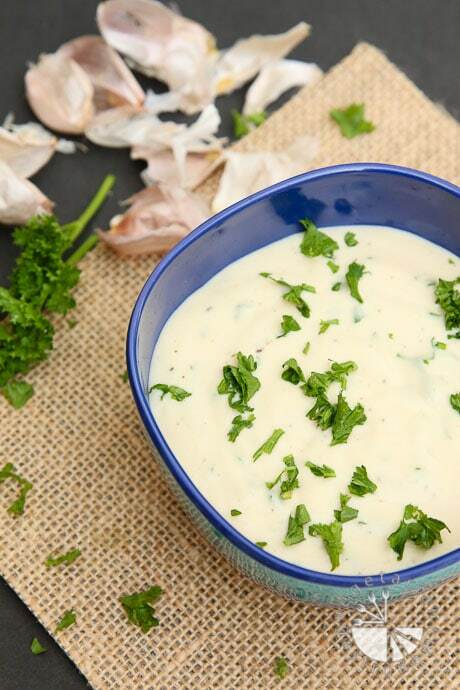 I already have a few recipes in the works using this aioli, one of which is coming your way soon! 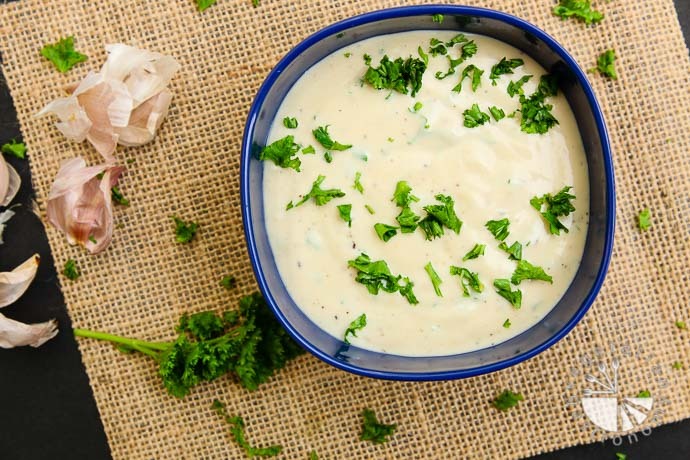 In the meantime, you can enjoy this aioli as a dip or spread. If you follow me on Instagram or Facebook, you’ve seen me incorporate this aioli into one of my go-to quick lunches, a Veggie Wrap. Simply spread a thin layer of this aioli onto your favorite grilled tortilla, add fresh spinach, cucumbers, tomatoes, bell peppers, avocado, and top it off with some crumbled Way Better Snack Tortilla Chips (Which by the way, if you’ve never had, are delicious. I typically purchase them online or from my local Sprouts Market. My favorites flavors are the sweet potato, simply blue, black, and sweet chili). I made this again last week for a good friend, and she couldn’t believe how amazing the wrap was and loved the flavor of this Aioli. More ways on how to use this Aioli coming to the blog soon! 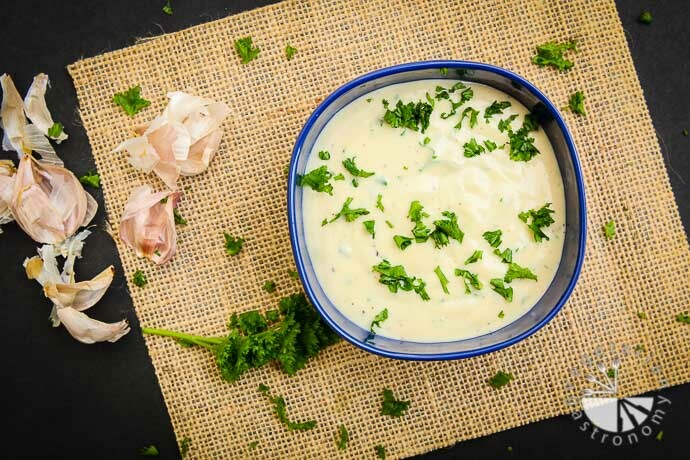 Roasted garlic and truffle combine to give this creamy delicious vegan aioli. It's perfect to use as a sandwich spread or dip. Leaving the head intact with all of the garlic cloves attached, peel off as much of the outer loose layers of the garlic head. Trim off the top of the garlic head, making sure to expose as many garlic cloves as possible. 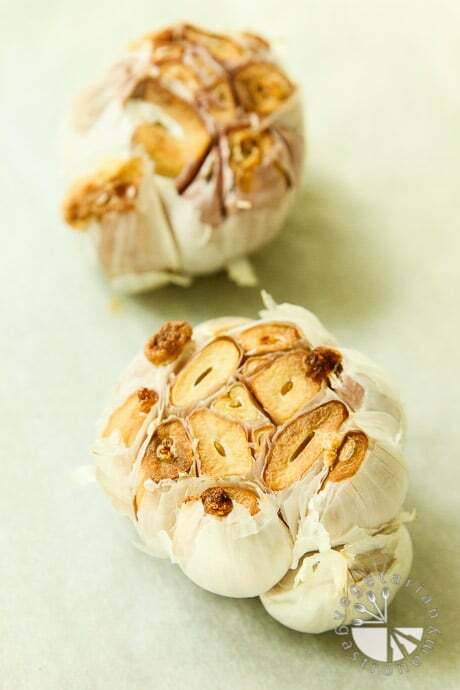 Wrap each garlic head in a small amount of foil and bake on a baking sheet for 35-40 minutes until the exposed garlic looks slightly browned and is completely soft. If needed, you can check this by using a knife to pierce through. Once the garlic is roasted, remove from the oven and let them cool until easy to handle. Open the foil and remove all the roasted garlic cloves with a knife or with your hand. 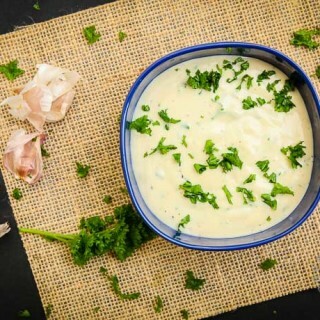 In a blender, such as a Vitamix, combine the roasted garlic, vegan mayo, silken soft tofu, salt, and fresh lemon juice (start lower and add more as needed). 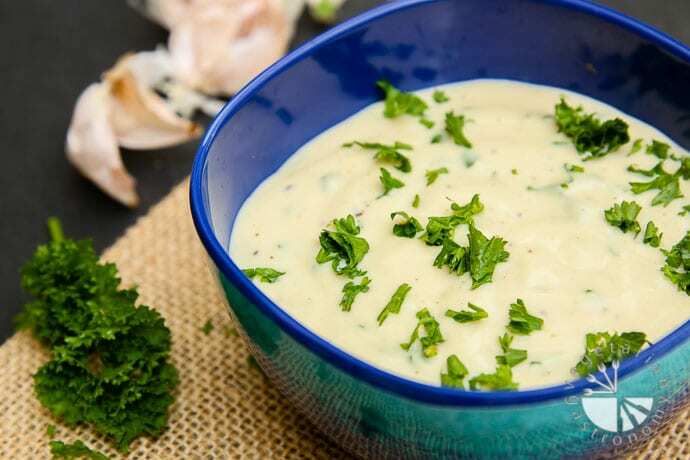 Blend until completely pureed into a thick and creamy aioli. Pour the aioli into a bowl. Add more lemon juice and/or salt to taste and whisk. I always recommend starting off with less lemon juice. Depending on how sour your lemons are, you can easily add more to taste. Add the white truffle oil and completely whisk into the aioli. The amount of the truffle oil depends on the amount of truffle flavor you prefer. Add and combine some freshly ground black pepper and minced fresh parsley. Chill in the fridge and use as a spread for sandwiches or wraps, or as a dipping sauce! Tofu - The soft silken brand of tofu is what I prefer for this recipe to give it that ultra-creamy aioli-like texture. I use tofu to cut down on the amount of vegan mayo used, but you can also simply use more vegan mayo for a completely soy-free option. This looks amazing Anjali and super delicious! You can easily leave it out actually. Should taste just fine. Although I haven't tried it, you may be able to simply use vegan mayo in a bind (although the aioli is wayy better!). Let me know if you try! The tempeh on it's own is so delicious as well. Could I freeze this? This looks like my new favorite condiment and I'd like to have it on hand all the time. That's wonderful to hear! So glad that you love it! It's useful for so many different things. Although I've never tried freezing it, there's no reason why you couldn't. You MAY need to give it a quick mix or whirl again in case some of the ingredients separate, but I think it should be fine! 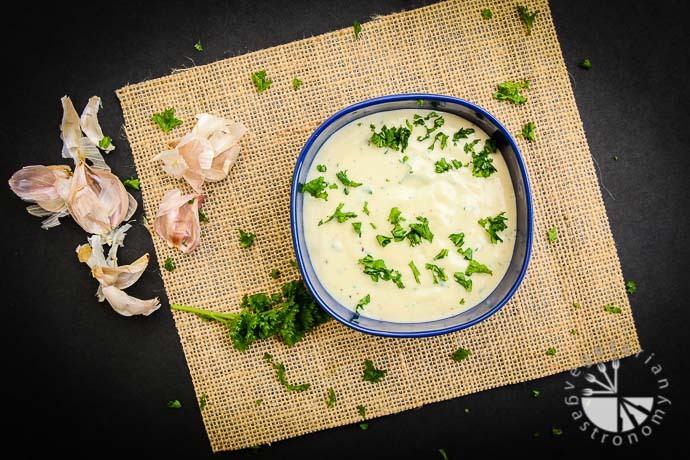 Next time I make this aioli I'll try it out, but if you get to it first, let me know! I've frozen my chipotle aioli many times and it's been absolutely fine. Hi there. How long would this last in the fridge after its been made. I'd say around 3-4 days. Can I use some other oil instead of truffle?? I don’t get truffle oil where I live..
You could probably just leave out the truffle all together since I don't think there's a great sub. I was going for that truffle flavor here which is why I used the oil :) If you're looking for something non-truffle and creamy sauce, then check out my Chipotle aoili or vegan cucumber ranch...they are TO-DIE-FOR! Let me know what you end up trying! We like garlic, the sauce is perfect for anything.